TARDIS cartoon Lost in a Wormhole, Unpacking into an Anti-TARDIS! TARDIS cartoon: If you’re in any way familiar with this blog you’ll know I’m a huge Doctor Who fan (I run competitions to win a Doctor Who caricature every time he/she regenerates). I was delighted about the mention of the anti-TARDIS in Charlie’s latest column, so here we have the rural Galway version of the TARDIS that’s “much smaller inside than you’d think from outside“. I’ve not yet seen any of the current Doctor’s adventures as I fell behind on my Capaldi-era as I was between providers (I got rid of my telly channels and just watch stuff on demand now) but I’m on a rewatch (we just finished Day of the Doctor which was a GLORIOUS high-point of Moffat’s weird mixed bag as show runner before the nadir of Time of the Doctor) so I’ll be caught up to her soon enough, and I’m really looking forward to it. Of course with a time-travel show you don’t have to watch it chronologically. In fact you probably shouldn’t. 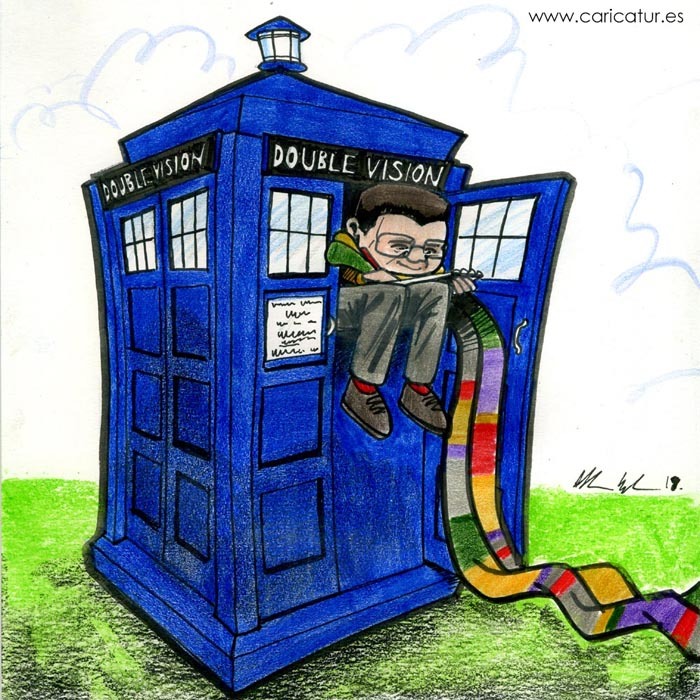 If you like this TARDIS cartoon you should check out more Double Vision cartoons here. I think she does a great job as the Doctor, and her crew are fun, but the show’s let down by an enforced liberal agenda that’s preachy and out of place. Still a fan though, as you will be too, I suspect. It made a bunch of MRA Cybermen malfunction, that’s good enough for me!